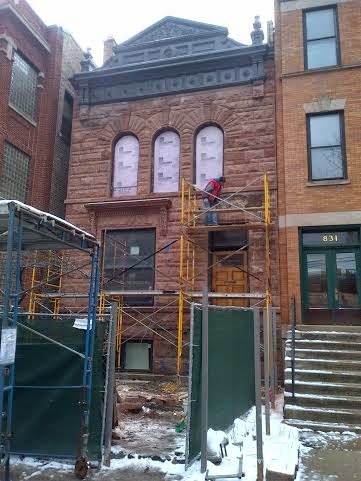 It's always good to see a restoration of a vintage building around the North Side. We spotted this project early in the week but don't have any other information. In this case we didn't get close enough to read the permit. The 800 block of West Wellington shares real estate with expanding Advocate Illinois Masonic Hospital. However, the location is fantastic for access to CTA Brown Line, buses, restaurants, services and pretty close to the lake. We love Chicago for classic buildings in busy urban settings. This location of West Wellington is across from Advocate Illinois Masonic Medical Center campus. A hospital may not be the most desirable neighbor but the location is certainly vibrant and convenient to transportation and services.